Cast your mind back six months to last October. Can you remember what was in the news? Probably not. You can be sure Brexit was in there but it seems a long time ago. A scan back through the front pages shows it was the month when British Prime Minister Theresa May was making a fool of herself by arriving on stage at a rowdy Conservative Party conference to Abba’s ‘Dancing Queen’. She was defending her strategy in the EU-UK divorce talks. So not much has changed there. 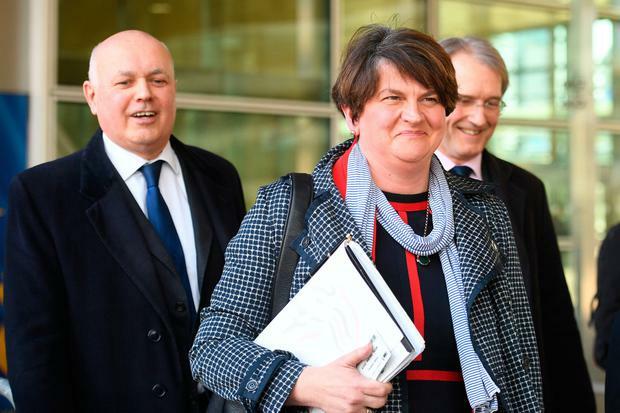 It was also the month DUP leader Arlene Foster was asked how red her Brexit red lines were. Her tune hasn’t changed much. This week Ms Foster accused the prime minister of being “weak” and trying to force “people into a cul-de-sac”. Of course, there was other news too. At Leinster House, Denis Naughten resigned as communications minister amid controversy over his dinners with a businessman who is bidding for the National Broadband Plan. We were weeks away from a decision being taken on the massive scheme that will bring high-speed broadband to all of rural Ireland. Six months on and we are still waiting for the Cabinet to sign the cheque. Peter Casey was in the headlines on his way to finishing second in the presidential election. This week, he’s back in the papers after entering the race for the European Parliament. And tragically, it was the month when Emma Mhic Mhathúna lost her battle with cervical cancer. That scandal shows no sign of abating. It all suggests that while the “terms and conditions” have changed over the past six months, we have not really crossed any of these topics off the political agenda. There are unique reasons for why each of these stories are still running – but the trend suggests six months really isn’t a very long time. When it comes to Brexit, the new deadline set for Mrs May to find an orderly way out of the Union for her country seems lengthy on paper. He said Britain still had all the options on Brexit available, from approving the stalled divorce deal, to changing its leave strategy to cancelling the departure altogether. So much time and energy has been squandered with Conservative Party in-fighting. But what makes people think things will be any better when Mrs May tries to woo the Labour Party? Labour leader Jeremy Corbyn said yesterday the second Brexit extension in the space of a fortnight represents “not only a diplomatic failure, but is another milestone in the Government’s mishandling of the entire Brexit process”. His ultimate goal is to secure a general election, not drag Mrs May back from the cliff. It’s difficult to see what incentive he has for giving her an easy way out. The back and forth between the two parties in the coming weeks is likely to be comparable to what we saw between Fine Gael and Fianna Fáil during the confidence and supply talks. From the time of the election here it took seven weeks for those conversations to reach a successful outcome – in the national interest. The EU is planning to carry out a review of progress in June at its regular summit – but Brexit will be down the agenda as leaders try to move on. “June is not a cliff-edge, or a moment to take new decisions, it must be clear,” Mr Tusk said. As part of her bid to secure an extension, Mrs May told her colleagues the talks with Labour are going better than reported in the media. If that is true, you would expect major progress by the end of June – especially as the prime minister had originally asked for the leave date to be set at the end of that month. However, as we put Brexit on the backburner for now, it’s worth remembering six months is actually a long time.